My new white jeans from Target! (Another addition supplementing my ‘normal’ wardrobe with bigger sized clothes while I work on the baby weight.) I like the Denizen brand at Target because the denim is heavier and feels better quality then other pairs of cheap-y jeans I get from Target or Old Navy. And especially with white jeans – I don’t want them being too thin and showing off any lumps or bumps that they shouldn’t! 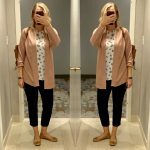 Looking for inspiration for the white jeans – I pinned like twenty Reese Witherspoon outfits. She is definitely the celebrity I emulate the most. She has such cute & relatable style. Also – from December: 23 ways to wear a jean jacket. Great outfit and look. Those jeans are cute and slimming. Also good job on your progress on losing the after pregnancy weight. Love this outfit! FYI – the jeans you linked to as 'shop same' are Mossimo brand and not Denizen. I actually went to Target yesterday after you mentioned white jeans, and the Denizen ones are what I got, so they are probably the same! Thanks! Hope your outfit works out great!